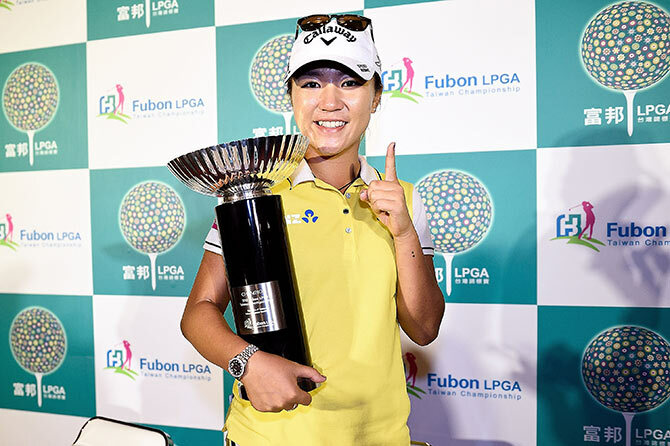 Lydia Ko cantered to a nine-stroke victory at the LPGA Taiwan Championship on Sunday to take back the women's world number one spot from South Korean Park In-bee. Ko started the final round with a four-stroke advantage and then carded a seven-under-par 65 for a total of 20-under, which also made the 18-year-old New Zealander the youngest player to earn 10 wins on the LPGA Tour. "I have played consistently well over the last couple of weeks and it's something we can all celebrate and I want to share this with my whole team," Ko said after her win. Ko needed to win or finish second in Taiwan to move ahead of Park, who did not play in the tournament, and she could not have asked for a better start in the final round as she sunk four birdies in her first six holes. Her only bogey of the day came at the seventh, but she eagled the 12 and picked up two more strokes with birdies at 14 and 18 for a best-of-the-day 65. Ko, who claimed her fifth LPGA victory of the season, became the youngest player to win 10 Tour titles, taking that honour from Nancy Lopez. Lopez won her 10th title when she was 22. "I actually met her in Cleveland a couple of months ago, she's such an amazing person and amazing golfer so to have beaten her record, it's an honour," Ko said after pocketing a cheque for $300,000 for the victory. South Koreans Ji Eun-hee (70) and Ryu So-yeon (68) finished tied for second spot at 11-under. Britain's Charley Hull finished fourth a shot further adrift.